Strelna is the oldest suburb of St. Petersburg, located on the southern coast of the Gulf of Finland. The village is located on the banks of the Strelka and Kikenka rivers.Strelna is famous for its palace and park ensemble, an architectural monument of the 18th century Konstantinovsky Palace is located here. Even in the writings of the Kikensky churchyard of 1500 it is said about the village of Strelna "on the Strelna River by the Sea". In 1617, between Russia and Sweden in the village of Stolbovo near Tikhvin, a peace treaty was signed, which ended the Russian-Swedish war of 1614-1617 and the village of Strelna, among other territories, passed to Sweden. The victories in the Northern War (1700-1721) allowed Russia to obtain land on the shores of the Baltic Sea, including the Strelna Manor, where Peter I often stayed on trips from St. Petersburg to Kronstadt. In 1716 the Road Palace of Peter I was built, whose author is unknown. At the same time, the Church of the Transfiguration was built in Strelna, and greenhouses were built around the palace.Soon in 1719-1720 the palace was rebuilt on the orders of the emperor. On the bank of the Strelka River a nursery with ornamental trees and shrubs was located, the river was blocked by a dam and a pond was created, later called the Orlovsky. The channel of Strelka river was increased on 400 meters and the quay began to be built at the mouth. Greenhouses were built along the shores, and the sovereign gardens in high places. Later in 1750, under the direction of Francesco Bartolomeo Rastrelli, the reconstruction of the Petrovsky Palace was carried out. Under the frame, a stone foundation was laid, a balcony and twelve halls were restored, and the building was given a symmetrical appearance. In 1786, under Catherine II, the palace passed to the military department and for some time it housed a hospital. In the 1837-1840s, the restoration was carried out under the guidance of the architect Christian Meyer, who managed to give the structure its original appearance. The palace of Peter the Great was almost never empty and therefore well preserved.In 1951, a plan for the construction of 1749 was found and on it the architects managed to create the appearance of a palace at that time. Some time in the restored building was the Kindergarten. Now the Palace of Peter in Strelna is under the protection of the state, it is an architectural monument of the 18th century and a museum is located here. Among his collections are a patchwork quilt made by Catherine I, a copper candlestick and the emperor's everyday costume, a ceremonial portrait of a young Peter and a bronze bas-relief of the emperor, executed by the model of Carlo Rastrelli. There is an interesting treasure chest of Alexander III with personal belongings, a washstand and a bed. Next to the palace is an orchard and vegetable garden with three varieties of potatoes, an avocado with wooden, glass and straw hives.In summer, excursions are organized in the park. But the Emperor's main dream was to create on the shore of the Gulf of Finland the eighth wonder of the world - a country residence with a palace and a garden, fountains and grottos. To create a palace and park ensemble, famous architects were invited. He began designing the palace of Bartolomeo Carlo Rastrelli, Francesco Rastrelli's father, but then he was removed from work and the project was executed by the French architect Jean-Baptiste Leblon. In 1719, he died of smallpox and the work on the project was continued by the Italian architect Nicolo Michetti. He promised Peter I to arrange here "something that has never happened before". Peter I personally was present at the laying of the palace and wanted the palace and park ensemble to be better than Versailles.N. Miketti decided to build a palace for his project, and the canals and avenues are mostly created according to the plan of Batista Leblon. Hundreds of skilled craftsmen and workers were involved in the work, but construction is slowing down next year. 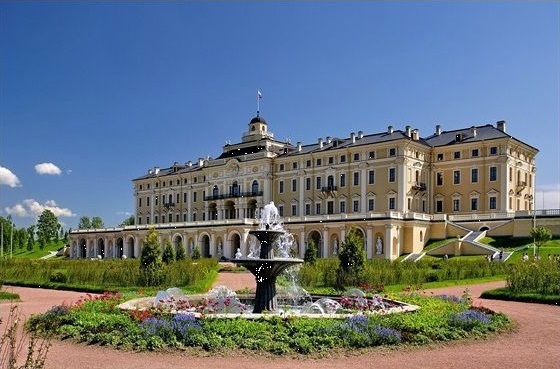 It became clear that without pumps, fountains in Strelna could not be created, and in Petergof by nature was created for this condition, and Peter I preferred his Northern Versailles, making it a grand country residence. In 1723, Michetti leaves for his homeland and construction continues under the guidance of his students, talented Russian architects Mikhail Zemtsov, Timofei Usov and Peter Eropkin. Peter I was busy with important state affairs, and after his death the erection of the palace was slowed down altogether. Walls and ceilings were built and the building was completed in black by 1726. For some time, grottoes and terraces were still being built, but by 1730 the construction was suspended. The palace was covered with a temporary roof, windows and doors were filled with boards. After 10 years, the building was badly damaged by fire. To restore and complete the palace and realize the plans of Peter I, in 1743-1750 the daughter of Emperor Elizabeth Petrovna attracted to the construction of the court architect Francesco Bartolomeo Rastrelli. The palace was rebuilt, the building acquired a magnificent appearance - it was decorated with two high wings, arches and columns. The majestic building of the Palace rose to a height not far from the shore ridge. Two wings are connected by a solemn triple arcade. Groups of twin columns and a high roof, a figured pediment in the center create a look reminiscent of the Venetian palazzo of the Renaissance. Before the Palace was one of the first in Russia regular park, intersected by canals. In 1797 Paul I presented the estate to his youngest son Constantine and since then the palace and park ensemble has been called Konstantinovsky. Russian rulers in Strelna spent little time giving preference to other suburban residences and so, over time, the Konstantinovsky Palace was dilapidated and one of the terraces collapsed in it. Her restoration was carried out by architect Andrei Voronikhin, who not only rebuilt the terrace, but also created stone grottoes and lined them with sea stones and shells, and the palace and park were connected by wide stairs. After the fire of 1803, the Italian architect Luigi Rusca rescheduled the mezzanine and some of the building halls. In 1837-1839 the Constantine Palace was completely rebuilt, and the roof was covered with sheet iron.